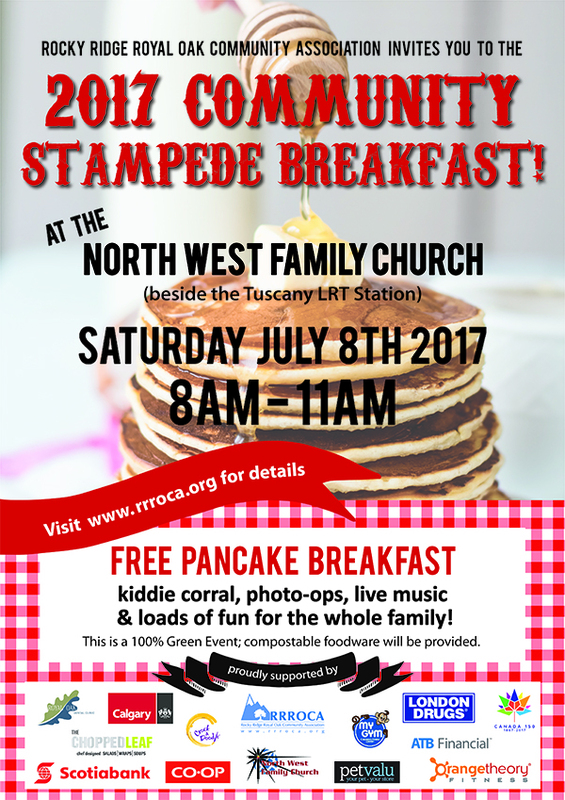 Bring in your family to RRROCA’s 2018 Signature Event! There will be loads of fun for the whole family. Enjoy a serving of pancakes or sausages and listen to the live western music, maybe try a few dancing steps. Take a shot at the family photo booth. Kids can have fun at the Kiddie Coral, can get a ride on the bouncy castles, or engage the mascots, or participate in the clown balloon contest. We’ll use compostable food ware to make the event 100% green. Wear your best western gear and join us! Mark your calendar for Saturday, July 7th, 2018 between 8 am to 11 am. The Rocky Ridge Royal Oak Community Association (RRROCA) wishes to invite our residents to take part in fun events, activities and group gatherings with their neighbours, on this year‘s fourth annual City of Calgary Neighbour Day celebration coming up on June 16, 2018. RRROCA members can apply for Neighbour day Grant 2018 today at Member portal and you will be entered to win 1 of 5 grants ($100) to hold a block party on Neighbour Day June 16 (Saturday). The closing date for application is Sunday, May 27 at 11:59 p.m. A draw will be held on Monday, May 28 at the RRROCA board meeting. Watch for the mobile skate park to be set up in the rink at RRROCA Park. See the website below for rules, please note this is the 2017 website, as the city has not offered a 2018 update. Please register on line HERE – Registration ends on May 21st at 9:00 pm! You must be a RRROCA member to participate. If you are not a RRROCA member please sign up as a NEW member. Please note: registrants can pick up Garage Sale signs between 4:30 – 6:00 pm on Wednesday May the 23rd at William D. Pratt school located at 9850 Royal Oak Way NW (Front parking lot). Come and find trinkets and treasure without leaving the neighborhood! This vibrant community building event is sponsored by Zeena Taghvai Real Estate Agent of RE/MAX Real Estate Mountain View! She is providing garage sale sings to registrants, she will also have garage sales sings posted in certain spots in both neighborhoods marked with a special directional signs. Zeena will also have 5 large bold signs placed in different areas surrounding Rocky Ridge/Royal Oak to draw public attention to the event, in order to bring more traffics/people/shoppers to the neighborhoods during the event, as a result participants will have much success in selling their items. Zeena will also place an ad in Calgary Herald about the event a day prior to the event as well as for the duration of it. We hope to you see you out shopping in both neighborhoods. RRROCA’s Signature Event! 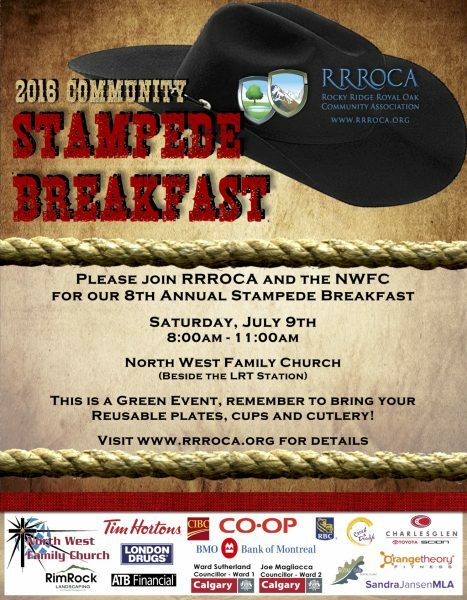 Join your neighbours for our 9th annual Community Stampede Breakfast on Saturday, July 8, 2017 from 8am – 11am. 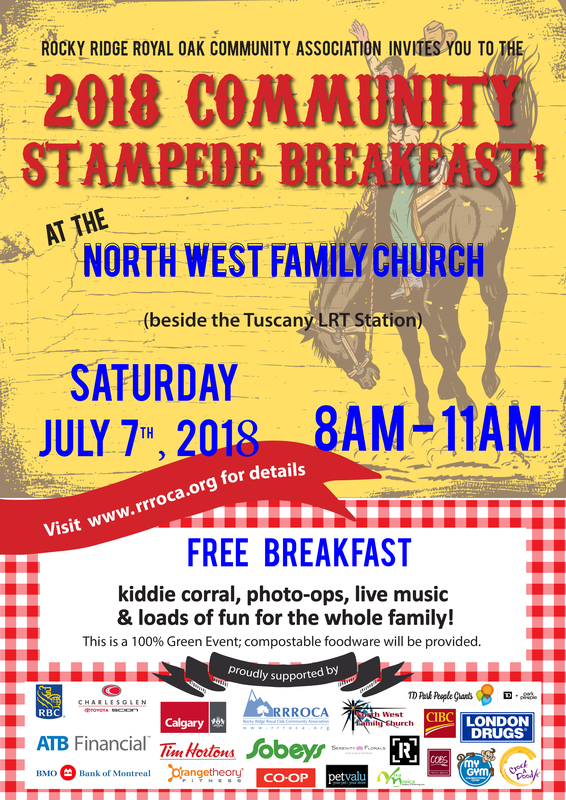 Pancakes and sausages are served along with loads of fun for the whole family, including a kiddie corral, photo booth, live music, bouncy castles, mascots, children’s crafts and maybe even some impromptu line dancing! This year’s event will be held in the parking lot of the North West Family Church (10307 Eamon Rd NW). Last year’s breakfast was attended by over 4,000 guests! Compostable foodware will be provided to make the event 100% green. See you there in your best western gear. Yahoo! RRROCA would like to help you celebrate by providing five separate $100 grants to residents who are putting on Neighbour Day events! The grants are first come, first serve, so register now by filling out the form HERE! 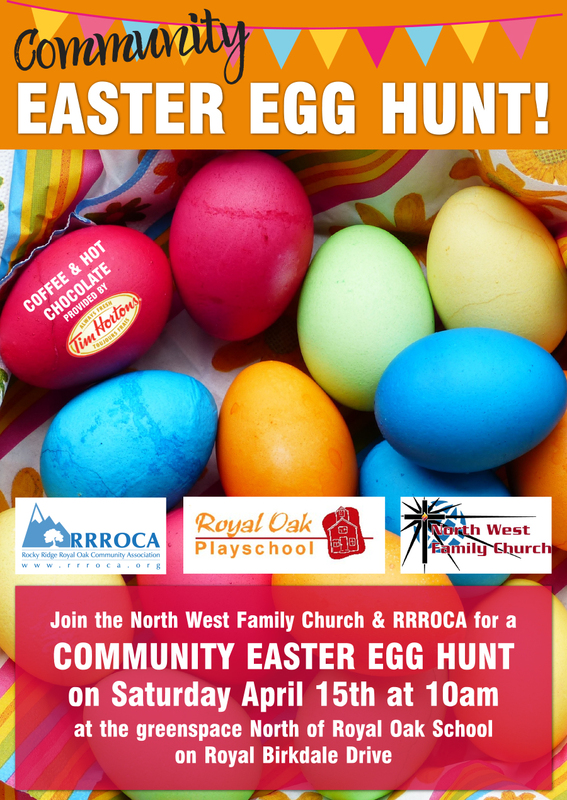 Join the North West Family Church and RRROCA for a Community Easter Egg Hunt on Saturday, April 15th at 10:00am at the greenspace, North of Royal Oak School on Royal Birkdale Drive. Coffee and Hot chocolate provided by Tim Hortons. Please join us on Saturday, February 25th at 3:00pm for a FREE screening of “The Secret Life of Pets” at the Royal Oak Victory Church, brought to you by the Rocky Ridge Royal Oak Community Association (RRROCA). Doors open at 2:30pm and complimentary popcorn and drinks will be provided. Hope to see you there! RRROCA is pleased to once again partner with London Drugs and the City of Calgary to host our annual Community Cleanup. This event encourages community residents to responsibly recycle household items and helps divert waste from Calgary’s landfills. 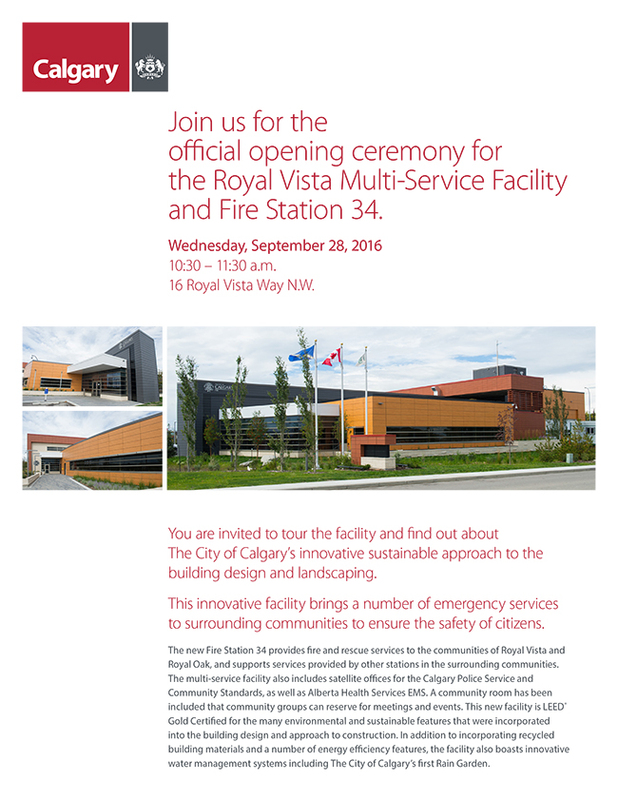 It is FREE of charge and open to all community residents. London Drugs will be rewarding customers who bring in items for recycling throughout the day. 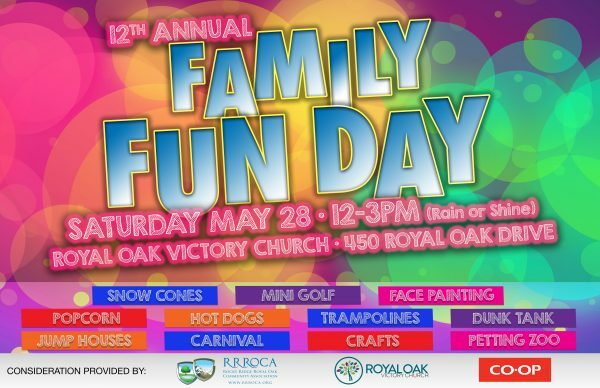 After dropping off their items, residents are invited to enjoy a FREE community BBQ put on by RRROCA and sponsored by London Drugs. BBQ starts at 11am. Note: Large appliances are not accepted. Kidseat Recyclers will be accepting used and expired car seats. Note: There is a mandatory recycling levy of $10 per car seat. All fabric must be removed from the seat before drop-off. Calgary Metal Recycler will be accepting household metal waste items. The City of Calgary will be accepting organic waste and household waste items at the end of their usable life that cannot be recycled and do not fit in at home waste and recycling carts. Note that the following items are NOT accepted: tires, home appliances, household chemicals, propane tanks, car batteries, liquids, paint, railway ties. This event is for household items only. Large-scale drop offs or commercial loads are not accepted. Do you live in Rockyspring? We want to meet you! Come and join us for a Neighbour Day Party at the park! Bring along lawn chairs and come ready to meet others from Rockyspring. 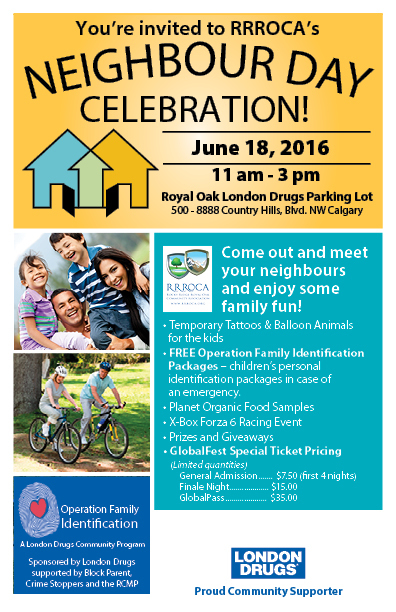 RRROCA & London Drugs invite you celebrate Neighbour Day! London Drugs Royal Oak will be offering free Operation Family Identification (OFIs) packages. Pioneered in Canada by London Drugs and supported by Block Parent, Crime Stoppers and the RCMP, Operation Family Identification packages are designed to give parents a permanent record of their child’s photo, fingerprints, weight and height, in a convenient, readily accessible kit that can be used in the event of an emergency. Operation Family Identification is a community project sponsored by London Drugs with the participation of community volunteers and law enforcement officials, and is offered at no charge to parents. Make up your own way to celebrate community spirit in Calgary! Click HERE to download The City of Calgary’s Neighbour Day Event Planning Kit. Find trinkets and treasure without leaving the neighbourhood. Our annual Parade of Garage Sales will be held May 27-29, 2016. Hours on the Friday are 3 to 8pm, and 10am to 5pm on the Saturday and Sunday. 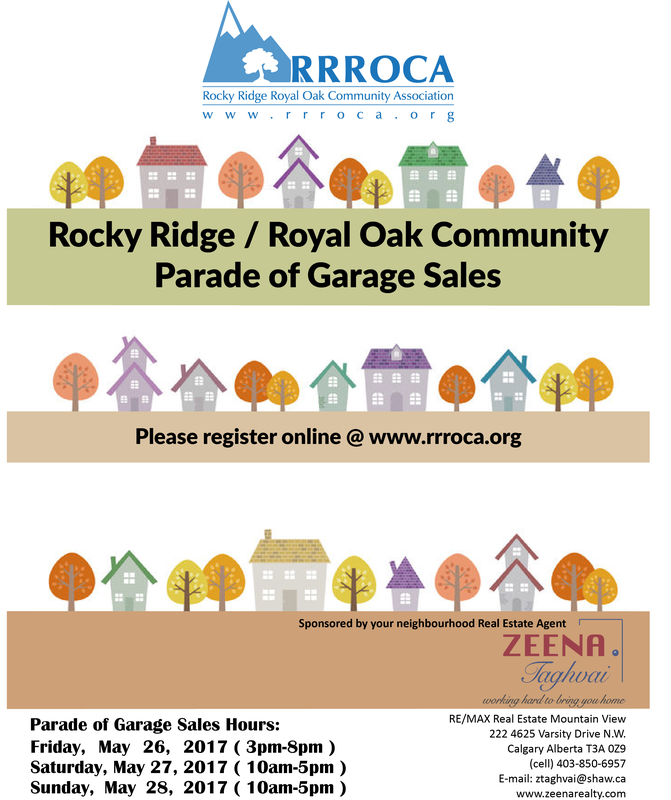 Courtesy of our sponsors, Realtor Zeena Taghvai, RE/MAX Real Estate Mountain View and the Bank of Montreal, Royal Oak Branch, participating garage sales will be marked with a special sign. Check back soon for the map of participating homes! We hope to you see you out shopping the neighbourhood this weekend! Did you register your home to participate in the Parade of Garage Sales? Registrants can pick up Garage Sale Kits from 12pm to 6pm at BMO, Royal Oak Branch, on May 26, 2016. Fun for all ages! 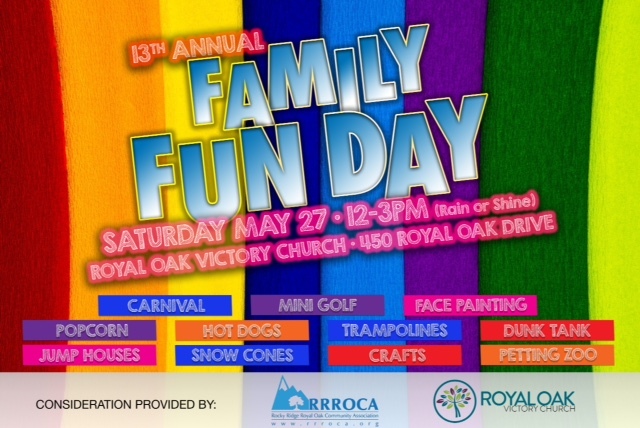 Royal Oak Victory Church (ROVC), in partnership with RRROCA, once again hosts our annual Family Fun Day. It is a carnival for all to enjoy with sno cones, hot dogs, popcorn, dunk tank, carnival, jump houses, crafts, mini golf, face painting, rides, games, and a petting zoo. A new addition this year – trampolines! This event will take place on Saturday, May 28 between 12-3pm, rain or shine. Stop by as you make your way around the neighbourhood for the Parade of Garage Sales! Ample parking at the HOA parking lot next door. Through the month of May, ATB Financial raises money, with the help of our customers, for the Alberta Children’s Hospital. 100% of the money raised goes directly to the Alberta Children’s Hospital. Come out and show your support. For only $5, you get a hot dog, pop and round at the giant bouncy laser tag course. Also enter draw items such as an opportunity to golf with Edmonton Oiler Forward Jordan Eberle at the Valley Ridge Golf Club this summer to read Also enter a draw to win prizes including golf for two at Valley Ridge Golf Club with NHLers Jordan Eberle and Thomas Hickey; a Flames Jersey and Picture; round of golf for two at Valley Ridge Golf Club; wine raffle; and, Big Teddy Bear. Tickets to enter the draw are $10 each.